The myth of the lone inventor is one of the most pervasive in our culture; it is also one of the most incorrect. Quintessential lone geniuses such as Edison, Einstein and Tesla were far from recluses. Many of their greatest breakthroughs were born of deeply collaborative relationships with other inventive minds. 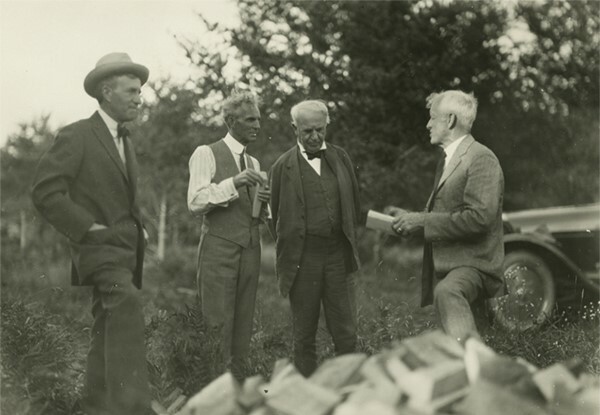 Henry Ford, Thomas Edison and Harvey Firestone, and John Burroughs created a group called The Vagabonds. No, this was not a billionaire’s sardonically named rock band; these rock star innovators understood that by working together, they could each achieve much more than they could on their own. To collaborate is to “work jointly with others or together especially in an intellectual endeavor.” This is precisely what SOLIDWORKS xDesign has been built to do. 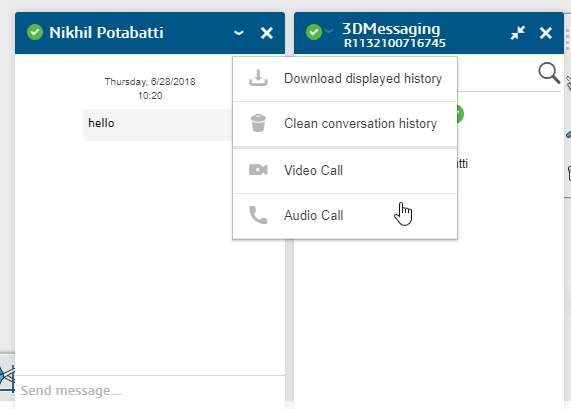 From 3DDrive for online storage to 3DSWYM for community to 3DMessenger for real-time chat, SOLIDWORKS xDesign and the 3DEXPERIENCE platform were designed to facilitate and simplify collaboration. The “collaborative space” is a key component of the collaboration workflow in xDesign. 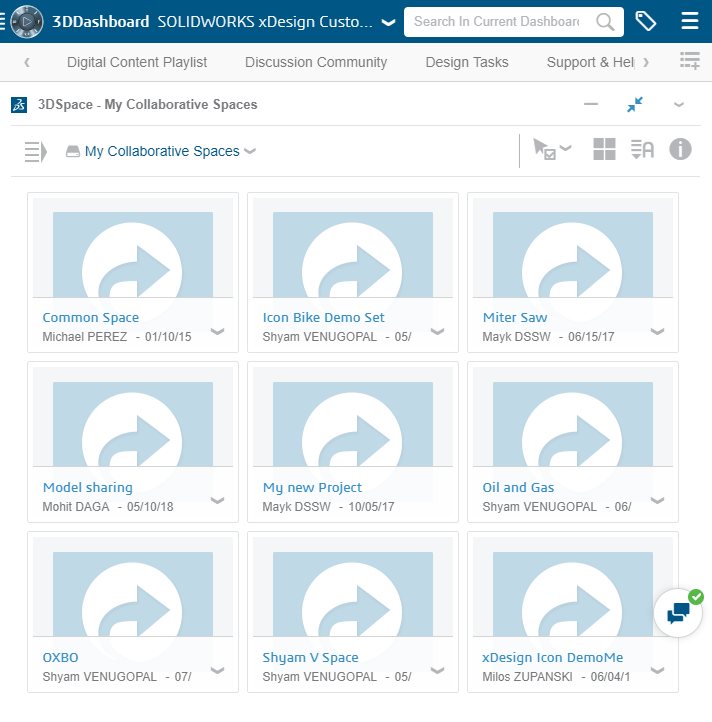 Every instance of SOLIDWORKS xDesign comes with a common collaborative space that is open to all members of that tenant, i.e., any content in this common space is visible to everybody on the tenant. A tenant is a group of users, from a company for instance, who share a common access with specific privileges to the software instance. In xDesign users can create separate collaborative spaces to work on projects that need not be shared with the whole community. Common collaborative spaces are often used as content repositories for shared or standard parts. Built-in access controls ensure only authorized users can read or write into spaces. Here you can see a few collaborative spaces my colleagues and I have created to work on various projects. The “wisdom of crowds” approach to solving problems has been validated with the success of platforms such as Innocentive. SOLIDWORKS xDesign enables such social innovation and design workflows. SWYM is a community tool that is packaged with the SOLIDWORKS xDesign role. It allows members of the community to post content such as text, audio and video. The transparent and interactive nature of SWYM make it an ideal forum to communicate with other members of your design community. My favorite feature within SWYM is the ideation tool (see image below). This is a visual tool that tracks the journey of ideas and suggestions as they make their way from first being proposed, to being reviewed, planned and finally, being delivered. This is a great example of ideas being discussed in an open forum and being triaged by collaboration and consensus. You’ve probably noticed a little speech bubble icon at the bottom right corner of the images above; that’s 3DMessaging. This handy little chat app allows members of the platform to chat with each other in real time, eliminating the need to send email back and forth. 3DMessaging even has an audio and video call functionality built in. Move over Google Hangouts!! There are, of course, many other collaboration scenarios and workflows that we can discuss. Working with multiple people from directly within SOLIDWORKS xDesign, keeping track of revisions, access control, etc. are all baked into the product out of the box, though there is no “box” in the cloud software realm. We will discuss each of these topics, and more, in future blogs specifically about collaboration. Till then, Au Revoir. Want to join us? Sign up for the SOLDWORKS xDesign Lighthouse at: https://www.solidworks.com/how-to-buy/join-xdesign-lighthouse-program or just click on the banner below. Shyam is a Product Portfolio Manager at SOLIDWORKS. He has a Master's degree in Mechanical Engineering from the University of Texas and an MBA from Boston University. He has worked as an applications engineer for the microelectronics/semiconductor industry and has been with SOLIDWORKS since 2012.